Are you looking to have your child Baptized? At the Catholic Community of the Holy Spirit, we hold Baptisms on the 2nd and 4th Sunday of each month. The Baptism ceremony in Woodstown is on the 2nd Sunday of the month and begins at 10:30am. 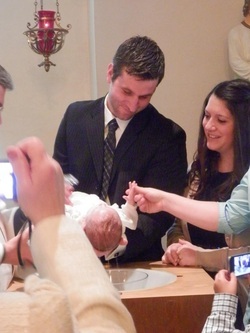 The Baptism ceremony in Mullica Hill is on the 4th Sunday of the month and begins at 12 noon. A Family Baptism Workshop is held the first Sunday of the month in Mullica Hill at 12 noon. The entire family is invited to attend this workshop prior to the scheduled Baptism. No Baptisms will take place during Lent. Please note that at least one godparent is required to provide a ‘Certificate of Eligibility’ from the Catholic Church they currently attend. This form is due at least one week before the baptism.